International stamps make up more than half of the museum's collections. See some of the rarest and most famous stamps from 24 countries on six continents. Browse more than 700 stamps, one from every country that has ever produced stamps—including many countries that no longer exist. 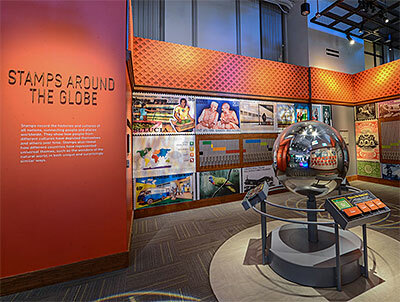 At interactives, explore how stamps reflect their countries of origin and connect people, places, and cultures worldwide. On view May 3-11, 2014, is an extremely rare philatelic item, referred to by stamp experts as the “genesis of philately.” The May 2, 1840, cover shows the earliest known use of two different philatelic elements: the Penny Black, the world’s first adhesive postage stamp, and the Mulready One Penny letter sheet.